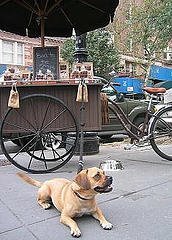 A traveling cart of organic, gourmet dog treats! Part of me thinks this is totally lame as a dog will pretty much eat anything, and doesn't know the difference between an expensive dog treat and week old pizza that it’s pulled out of the garbage. I have to say, I think fancy dog treats are a little too yuppy for me. On the other hand, the part of me that goes "ahhhhh...that's so cute" over anything animal related loves this idea! Also, these treats look so yummy, I'm actually tempted to eat one! Okay, not really, but I probably couldn't resist buying one for my dog, if I had one. If you live in New York City, click here to find out when the Dog Town Bites cart will be in your area. Mail order is also available via their site. The Best Thing about Getting Married? The Cake! Is There a 12-step program for Yogurt Eaters?